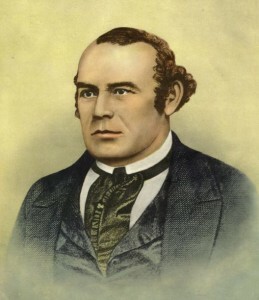 Who did Parley P. Pratt blame for the ignorance of the Missouri settlers and their attitude toward the Church? One of the great experiences of her life [Lucy Hannah White Flake—she is the daughter-in-law to Agnes Love Flake. William is the son of Agnes] was to participate with her husband, Prudence, son James, and others in the 1893 dedication of the Salt Lake Temple: “The Temple was grand and butifull . . . be[y]ond description.” On April 8, only two days after the initial dedicatory session on April 6, Elder Francis M. Lyman gave Prudence a blessing for her health in the temple and provided the opportunity for them to perform ordinances. William Melvin, Lucy and William’s second son, had died in infancy. He and James the oldest son, had been born before William and Lucy were sealed. James was sealed to them with Elder Joseph F. Smith officiating, while Elders Francis M. Lyman and John Henry Smith acted as witnesses. Then the Flake family performed the first ordinances in the Salt Lake Temple for both the living and the dead. Dedicatory sessions continued though most of April, and the next ordinances were not performed until May 24, 1893. David F. Boone, “ ‘As Bad As I Hated To Come’: Lucy Hannah White Flake in Arizona, Journal of Mormon History, Vol. 38, No. 4, Fall 2012, 78-9.